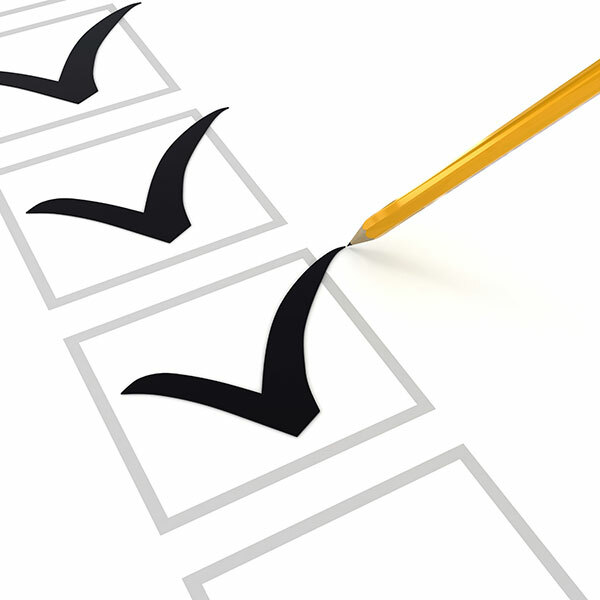 At Brewer Heating & Air Conditioning we strive for 100% satisfaction in everything we do. We value your opinion and invite you to tell us and others about your experience with us. Please take a few moments to tell us what you think by leaving us a review here on our website or on any of these popular review sites or social networks. Purchased my AC system from Brewers a few years ago. Works great. Service and support was a main concern. Twice they have come through on short notice. Most recently after cutting a wire while gardening they came out next day I came home from work and all was well. Best of all the repair was much less than expected. I would strongly recommend them. 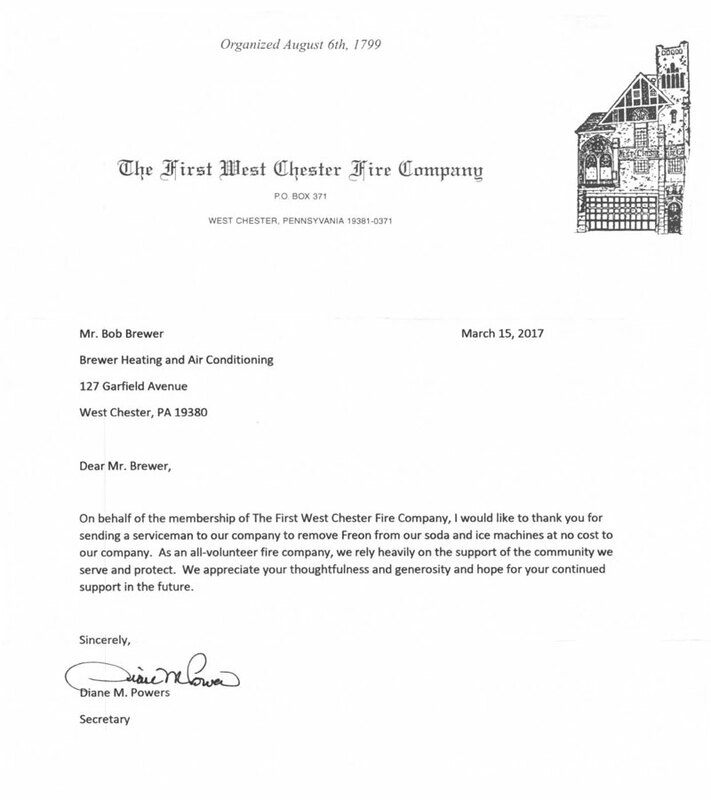 Thanks Brewers. .
On behalf of the membership of The First West Chester Fire Company, I would like to thank you for your recent assistance to our company in persuading Lennox to provide the coils to us at half price. We really also like to thank you for doing the work for us at cost. As an all-volunteer fire company, we rely heavily on the support of the community we serve and protect. We appreciate your generosity and hope for your continued support in the future. We wanted to give feed back on the recent repair of our HVAC system. Your technician, Joe, was able to quickly determine our TXV valve had failed. He arrived on time, was courteous, professional and answered all our questions. Last night was our first good night sleep in quite a while. It would appear you have a good ambassador to represent Brewer as a service provider for HVAC repair. We would recommend Berwer to anyone who is looking for ethical HVAC services. Bob – Thanks for taking care of this so quickly. Your crew was very professional and Nice! I appreciate your patience with this balance. Our entire building project, as most do, went way over budget. Tom and his entire crew did an outstanding job for us. We would recommend your company to everyone we know and I know from Tom, that you’ve already seen some new customers. Thank you so much for the great installation you did at our house right before Christmas. We are actually warm now when we go upstairs. It was such a great Christmas present to have our heat. Dear Bob – We would like to take a moment to “thank you” for being such an integral part of the completion of our new offices. It certainly took many hands to bring our dream of this fantastic office to fruition in record speed. The cooperative effort, of which you were a part, resulting in superior workmanship, has not gone unnoticed. It is wonderful to provide such an incredible environment for our staff to work in each day and care for our patients. This facility allows us to provide exceptional service to our patients and we continue to watch our practice flourish each day. It is amazing how impressed and truly excited our patients are when they visit us for the first time. We receive daily praise for your workmanship, as they marvel at our new facility. We are aware that you went above and beyond the call of duty and worked on a very intense time schedule to achieve the goals set by our team. However, you managed to do it! Thank you again for being a member of such a remarkable team. We truly appreciate your effort and commend you for your fine workmanship. Dear Brewers – Thanks for the fine service done by the technician who put in our new motor (Glen, I believe) and also for the same fine work done by Joey M. who does all the checkups. Hello Bob – I would like to say thank you to you, your company, and Joe M for the outstanding service provided during our lack of heat crisis. Joe’s professionalism and tenacity in repairing the heating system were greatly appreciated. His many calls back and promptness in responding, even though I was in Europe, was above and beyond the call of duty. Dear Tom – Brewer installed our original heating system many years ago when our community was first built. Over the years we have relied on you and your team on many occasions to service and maintain our Carrier unit. Recently, when the heater would not start, we called to have someone come out and when you were closed we tried Horizon. Horizon spent all of ten minutes here before they told us they could do nothing to assist us. Fifteen minutes later the service tech left with our check. What a mistake. One of your service techs came out a few days later and tried everything he could to get our heater started. Not ten or fifteen minutes but a full 2 hours. He tried everything including numerous calls back to your shop and was apologetic when he could not get the heater started. We knew it was time to invest in a new heater and there was only one company we were interested in talking to – Brewer. You personally came out to talk with us and helped us decide on a new system. It was ordered and installed within a week. When the installation team needed a few additional duct pieces, it was you who not only delivered them here, bat also assisted with the installation. Its companies like yours that we have relied on for many years and continue to rely on. From our phone contacts with your office, the service techs, and the installation team, we were treated to nothing but the best professional service. Dear Bob – Many thanks for all your concern, help and kindness with my air conditioning problem this week. It was such a comfort to finally be able to sleep in my home after staying with relatives for four nights. I appreciate all the efforts of both you and your GREAT STAFF. I pray that God gives you strength, peace, and continued good health. Dear Bob – As you know we have and continue to be a long term customer since we initially built our house in 1999. We very much appreciate your time and effort towards resolving our most recent A/C problem – thank you!! We will continue to recommend YOU and Brewers whenever the opportunity presents itself. Again, thank you. Brewer performed an AC checkup. The technician was polite and informative. I feel I can trust the work that Brewer does and will use them again. Brewer installed a new gas furnace, new air conditioner, water heater, humidifier and air cleaner. Everything went extremely well. I am very pleased with the atmosphere in the house now. Everything seems to be working beautifully. I am learning how to use the new, high tech thermostat. They were extremely helpful with the paperwork for rebates. They cleaned up after each work day and were very thoughtful that way. They answered my telephone calls promptly. I had used them for a few years before I had this work completed and knew their history through Angies List. Brewer installed a heat pump. They were very knowledgeable regarding the available products, and the owner himself informed us of the advantages and disadvantages of the various units being considered. We have used Brewer for years, and it always does a good job. Brewer replaced a dual zone (2 system) heating and air conditioning system with 2 thermostats and all the related hardware. Tom gave the quote and was flexible in adjusting the work to fit the budget and need. They reviewed multiple systems and came upon the correct ones for us. The work done was professional, the installers were great, and everyone did what they were supposed to do when they were supposed to do it. In todays day and age, its refreshing to find people who actually execute as planned. I can\'t say enough good things about Brewer and the job they did. P. S. - they are also great on small jobs too as we have used them over the years to keep the old system running. Went great from start to finish. After coming home from a vacation to the shore, we arrived home to find a hot house. Apparently the heat pump died. We were in the middle of a heat wave. Everyone was very professional. They were neat and cleaned up their mess. My furnace went out during a cold spell this winter. I was familiar with Brewer as I had used them in the past for work on my A/C unit and duct work for my hot water heater. These people are terrific. No pressure, no hype. High integrity and professional. They can be counted on to show up when you need them. They installed a new furnace and central air system. The new furnace was installed the next day after we placed the order and the A/C the day after that. Amazing!! The old units were removed, everything cleaned up. . . what an outstanding job!! The whole job went terrific. The Brewer staff are true pros. They showed up early in the am and didn\'t leave until they were finished. If you are considering a new furnace or central air unit, or some other type of upgrade on your present system, you should get a couple of estimates, but YOU MUST TALK TO BREWER - you will NOT be disappointed. Dear Tom, Once again, many thanks for such a perfect and professional installation of our new air conditioning system. We appreciate all your efforts and your help with the rebates. Please know that we are pleased and happy wiht the installation. May God bless you with strength, peace and continued good health.